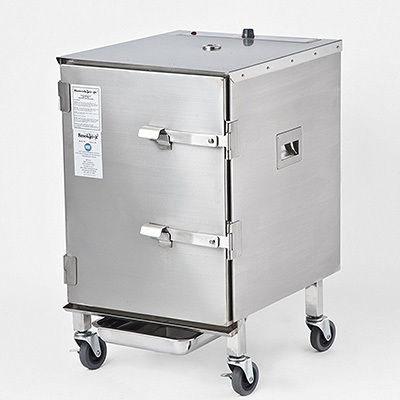 Electric smokers are a type of BBQ smokers that are fit for the modern age. The problem with most charcoal smokers or gas smokers is that they tend to take a lot of attention to do proper job which isn’t always practical for a lot of home chefs. Not only that, but in some cases you might not even be able to use a traditional smoker due to not having the space or being allowed in rented accommodation, for example. This is where electric smokers come in. 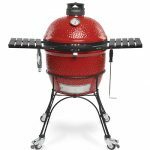 Electric smokers give you a good balance between ease of use and flavor and make great beginner smokers. Most electric smokers have temperature controls that allow true ‘set it and forget it’ capability, making it easy for anyone to have that authentic smoked BBQ flavor without the hassle of tending to coals for hours. Electric smokers provide a great, worry free way to smoke a range of food but are said to lose the ‘real barbecue’ taste. 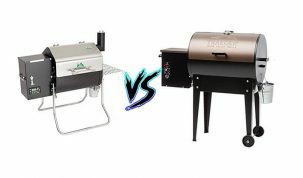 In this guide, we will take you through the pros and cons of electric smokers, what an electric smoker is and how an electric smoker works. We’ll also highlight the best electric smokers for the money with quick reviews and guides. 1.4 How does an electric smoker work? Read our full Masterbuilt Electric Smoker review for more information. 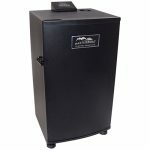 The Masterbuilt 20070910 30-Inch Electrical Digital Smoker is one of the best electric smokers that we’ve ever tested. It’s brilliance lies in it’s simplicity, it’s super easy to use and can be used almost anywhere. Not only that but this is brilliantly built. The quality for the price is second to none and we’ve found it holds its heat much better than any of the competition, which is very important for longer smokes. It’s also equipped with a generous 730 square inches of cooking space! This is the ideal smoker for beginners. As it uses electricity you won’t have to worry about coals or pellets and you simply have to turn it on and let it work its magic. If you’re looking for the cheapest electric smoker then go for the Smoke Hollow below as it’s a great introduction to electric smokers. 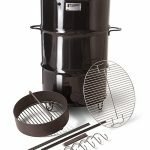 But if you’re looking for the best electric smoker for the money, then the Masterbuilt 30 Inch Electric Smoker is the one to buy. 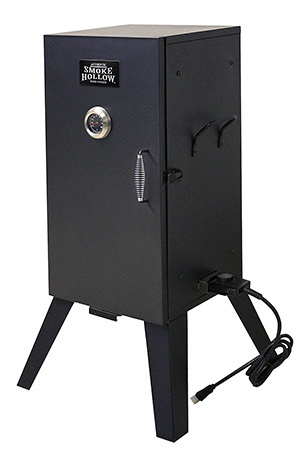 The Smoke Hollow 26142E is one of the best low budget electric smokers available today. It has two chrome plated cooking grids which can be adjusted to variable heights to allow several different things to be smoked at once. It has a porcelain wood chip tray and a porcelain water pan so you have everything needed to start smoking. 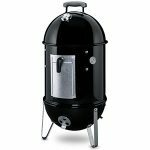 The entire smoker is well made, sturdy and has been very reliable. Obviously, there will be features missing that will be available on more expensive options, and it’s quite small, but for such a low price it’s a great introduction to electric smokers. That’s why this is our best low budget electric smoker. Side handles and a cool-touch spring wire door handle so you don’t even need gloves. The Masterbuilt 20077515 is very similar to the Masterbuilt 20070910 mentioned in the previous part. It’s the same capacity, it has the same amount of racks and uses the same 880W heating element. This one is also fully foam insulated and the build quality is just as good as the previous Masterbuilt electric smoker. So why is it generally $70 more money? 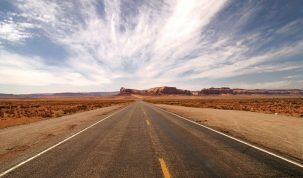 That comes from ease of use and additional features. Firstly, there is a huge glass window that we absolutely love. There’s nothing quite like being able to see your food cooking in front of you, until you realize that there’s nothing really to see. Still a nice feature though. Next, the interface is cleaner and easier to see and interact with. There is also an RF remote control and several different displays, such as internal light, and meat temperature. This really takes it a step beyond and gives you some really useful features. Just to top it off this model includes a smoker cover and a smoking recipe CD. If we had to choose just one electric smoker from the list to recommend to everyone then this would be the one! If you’re looking for the best beginner electric smoker then we’d have to recommend the previous Masterbuilt electric smoker as it’s cheaper and more appropriate for beginners. Handle and rear wheels makes moving easy. Having a portable smoker turns out to be a lot more important that we first thought as it makes such a great party food provider. You can fairly easily take it to your friends, and as it’s electric, use it anywhere in the country. Read our full Smokin-It Model #1 Review here. 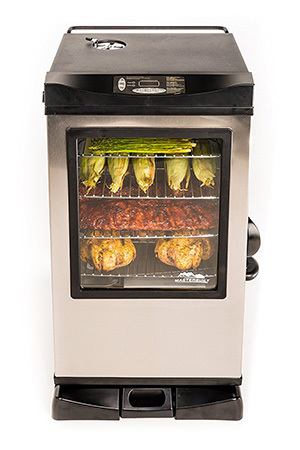 The Smokin-It Model #1 is a fully stainless steel electric smoker capable of smoking up to 22 lbs (10 kg) of meat or seafood at any one time. The steel is 18 gauge stainless steel that is certified for restaurant use. It has a 400 watt heating elements with LED indicators and is fully insulated with fiberglass to reduce heat loss and ensure maximum efficiency. It even has a 12 ft power cable so it can fit comfortably in almost any kitchen or outside. As you can probably tell the build quality is fantastic, it’s rugged and durable with several clever design details that really stand out. 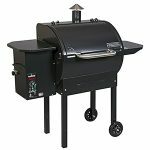 You will have to spend a little time putting parts of it together and there are a few alterations we would make, such as extra room for the drip pan, but overall this is a top quality smoker. The problem is that it lies on the very top of the mid range budget and therefore our go to is still the Masterbuild from before. 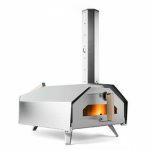 However, if you are looking for a sturdy, high capacity electric smoker that could be used in a restaurant if needed, then this is a great choice. One thing to note is that some people have noticed that the bottom shelves heat at a different rate to the tops ones. This means that the temperature at the top can sometimes be lower than at the bottom. For best results use a digital meat thermometer to keep an eye on the temperatures. 3″ Diameter rubber casters and 3 removable dishwasher safe racks included with space for 4 shelves total. There is enough space for a lot of meat, perfect for big parties or for use as a commercial smoker. New Side Handles for easy movement or lifting of smoker make it a doddle to transport. Can reach temperatures of 250°F (121°C). Just like the alternative mid range electric smoker we have a Smokin-It model in the high end category. The big brother of the Smokin-It Model #1 Electric Smoker is the Model #2. This is very similar to the Model #1, it uses the same high quality 18 gauge stainless steel and insulation, the same max temperature and the same number of dishwasher safe racks. But the major difference between the two is that the Model #2 is bigger! 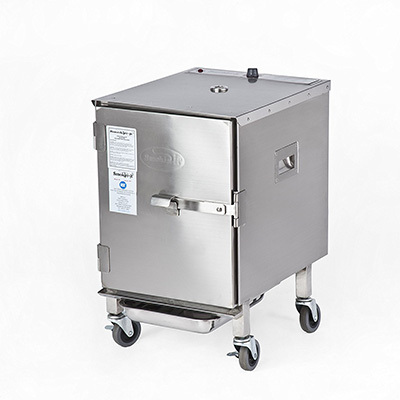 It has the capacity to hold up to 36 lbs of meat or seafood and runs from a brand new 800 watt heating element. Like the Model #1 this is completely certified to be used for commercial events and in restaurants. And has the same 12 ft power cord to make sure it can fit in any kitchen. Also, like the Model #1, the Model #2 has the same problems. The main one being that the heat is not transferred as evenly as you would like. This isn’t a huge problem and is easy to work around but it would have been nice to have had all that 36 lbs of meat be ready at the same time. Having said that, there is very little else to fault it on. The build quality is superb and the meat is always smoked amazingly well. If you’re looking for a high quality, reliable, large capacity smoker this is your best option. The Smokin-It Model #2 is the best electric smoker under $500. 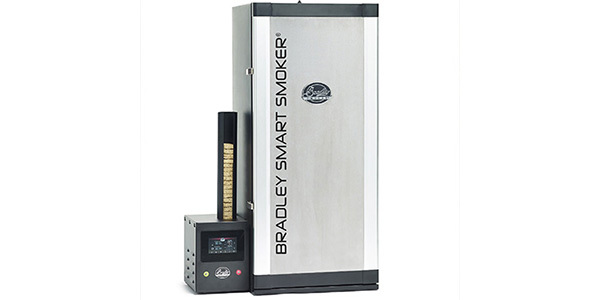 If you want the most high tech smoker available today then you won’t get much better than the Bradley BS916 Smart Smoker. 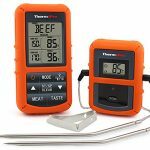 Not only does this work in the normal way, but there is the options to let you choose the exact settings you want to cook the meat exactly how you desire. 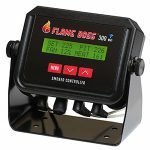 There is a touch screen that lets you choose the time, temperature and amount of smoke produced. 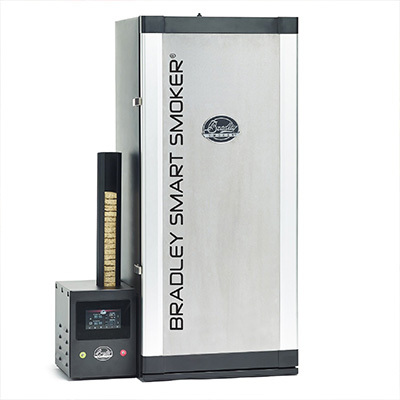 This is done by the Bradley Smart Smoker having 2 heating elements, one for heating the oven as usual and one dedicated heating element for solely smoke generation. We’ve only had the chance to use this smoker once but out of all the electric ones we’ve tried this had the most “authentic” taste to it and we think it’s due to the dedicated heating element. There are also two color-coded integrated probes that allow for tracking the temperature of the food. This was very interesting to see work and definitely helped in keeping control over the meat. All these different options are able to be controlled through an iOS or Android app on your smart phone or tablet. Whilst this is a cool feature we do think it’s a bit gimmicky and can’t see any time we’d use it over the standard touch screen. Overall this is a very interesting smoker, it’s a lot of money but we think it’s worth it. There are some gimmicks that we don’t think needed to be included but the quality of the meat and the options you have make it worth the money. Do be aware that some people have been having problems with theirs. The one we cooked on was absolutely fine and the owner has never had problems before or since we cooked. Just something to be aware of. Fully stainless steel interior and commercial grade silicone door make sure that the quality is what you would expect from a high end smoker. Space for 10 racks of food and multiple monitoring points for some of the most advanced monitoring we’ve seen. Electric smokers are a relatively new addition to the smoking family and allow many more people to start smoking, but you might be wondering how they work if they don’t actually have any live flames. Unlike traditional BBQ smokers, electric smokers work by regulating the flow of electricity to a heating element rather than the flow of air to a flame. The fact they use electricity means that they can find an permanent place in your inside or outdoor kitchen. It will depend on which electric smoker you purchase but yours will generally work the same as the rest. The heating element will turn on or off based on the temperature inside the smoker. This way the electric smoker can keep a relatively stable temperature whilst you go off and do whatever it is you need to do. Generally, there is also a water pan in the electric smoker to allow moisture to be taken in by the meat. There will usually be wood chips placed just above the heating element which will smolder and burn and produce small amounts of smoke. And that’s it, they’re relatively simple and super easy to use. If you’re unsure of whether or not you want an electric smoker this next section will hopefully help clear any misunderstandings or problems you might have. Electric smokers are mostly ‘set it and forget it’, meaning if you want you can set it up and forget about it until you’re done. You can even go to sleep when it’s running, there’s nothing that beats a BBQ breakfast! ‘Set it and forget it’ could also be seen as a con if you’re really into the nitty gritty of BBQ but we’ll let you decide for yourself. A lot less set up time and no messing around with charcoal or wood pellets. If you live somewhere that doesn’t allow cooking with charcoal then an electric smoker is a great alternative. 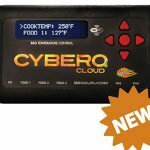 Potential to smoke many other types of food such as fish and you can even make jerky with an electric smoker. 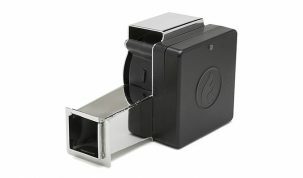 Can also be used as a cold smoker. Will usually only go up to a certain temperature. This probably won’t be a massive problem for most people but to have the option to get to higher temperatures is always nice. Electric smokers won’t leave the ideal pink smoke ring in the meat that BBQ enthusiasts crave. This isn’t a huge deal for the everyday smoker but if you’re looking for the very best quality BBQ then try one of the more conventional smokers. 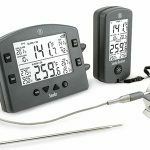 We recommend pellet smokers with a digital temperature controller as the very best BBQ smokers. Obviously, you’ll need a power outlet, if you’re planning to BBQ in the middle of a field or at an event, then make sure you have access to power first. Look after it well. As it runs on electricity and has many more electrical components than other smokers, there is a lot that can wrong. It’s best to keep it under a cover and make sure it doesn’t get damp. Make sure you season your smoker first. Electric smokers tend to need a good dry run before using with food. Check out our guide on how to season your new smoker to make sure you season it correctly. There should also be a section in your smokers manual about seasoning it. Most of the electric smokers you can buy will come with a built in thermometer. These are fine for a very basic guide to the temperature but for accurate readings of the inside of the meat we’d recommend picking up a digital smoker thermometer. Allow your electric smoker to get up to temperature before adding any food. Use different flavors of wood to change the smoke taste you get. We’ve made a complete guide to everything you need to know about using wood in smokers. We hope that this helped you find the perfect electric smoker for you. If you have any questions then write them in the comments and we’ll get back to you, or connect with us on Facebook.